This option may affect employee benefit programs where employers are providing employees with financial assistance and employees may lose the cost-effective advantage of paying through payroll. This will require adjustments to payroll systems and certain financial institutions may feel disadvantaged when their deductions are not allowed. Under this option, all parties will have equal right to deduct from an employee’s salary and there will also be improvements in employees honouring their financial obligations. Employers will have a choice in who gets paid from payroll and who doesn’t. Employees will be affected no matter which of the options is chosen in the end. “They may be subject to additional bank charges should voluntary deductions no longer be allowed, and it should be considered that many employees don’t have access to internet banking to make their monthly payments, thus creating a lot of additional administration for them” says Rocher. However, the benefits should not be disregarded, as many employees are subject to unfair lending terms and unreasonable interest rates, leaving them with minimal take-home (net) pay. 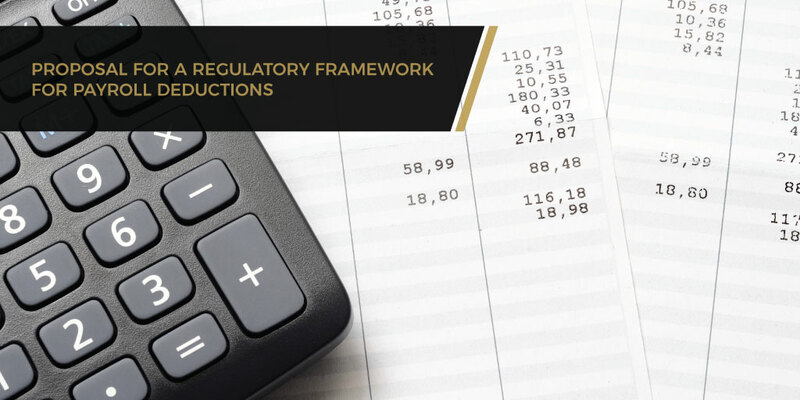 The SARB and National Treasury will be taking the public comments received in April under consideration and the preferred regulatory option will be communicated to stakeholders in due course. What are the regulatory framework options for payroll deductions?